Full day sightseeing tour "Royal castles of Bavaria"
Important information: the sightseeing tours of Bavaria and its royal castles can also be arranged starting from Munich or Salzburg. Should you wish to do so, please contact us! Starting from Innsbruck, we will travel through the upper Inn valley to Bavaria. Passing the medieval city of Füssen and enjoying a splendid view of its silhouette, we will then reach the village of Schwangau. Here, we will leave our bus, minibus or car to climb up to St. Mary bridge by carriage shuttle. From there, one can get an unforgettable panoramic view of both Neuschwanstein and Hohenschwangau castle. After having taken pictures, we will join a guided tour in English through Neuschwanstein castle discovering the place that inspired the Walt Disney castle of Sleeping Beauty. Your guide or driverguide will then wait for you at the exit of the castle and help you find good places to have lunch. In the afternoon, we will carry on to the picturesque village of Oberammergau with its splendidly painted facades. Via the skiing resorts of Garmisch-Partenkirchen and Seefeld in Tyrol we will finally return to Innsbruck. 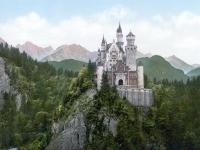 Comments regarding the excursion "Royal castles of Bavaria"
The program described above is just one out of many possible ways to arrange a full day sightseeing tour to Bavaria. Alternatively and depending on the time at your disposal, we can also include a guided tour to Hohenschwangau castle after the tour to Neuschwanstein castle or a visit to Linderhof castle and / or Ettal monastery on our way back to Innsbruck. It is also possible to start with a guided tour to Linderhof castle and to visit Neuschwanstein and / or Hohenschwangau castles in the afternoon. You are visiting the English section of the Innsbruck Tours website. Below this text, you will find links to important technical information. On the right column of the page, you may choose between different popular sightseeing excursions to and from Innsbruck by car, minibus and coach. To get information in a different language than English please click on the respective country flag.